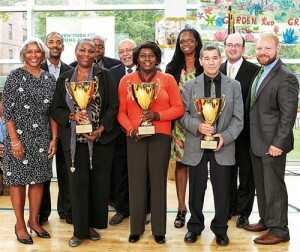 NYCHA celebrated the efforts of residents who participated in NYCHA’s Garden and Greening Award Competition. As part of the larger Garden and Greening Program, the competition serves to highlight the beautification and environmental efforts of NYCHA residents. Over 700 gardens charm developments across the city; glory blooms in the County of Kings! total NYCHA residency of 400,000 New Yorkers. A few happy flowers still radiate color amid clusters of spent blooms and cool weather crops from Fort Greene to Canarsie. To know this special division of the New York City Housing Authority is to tour Brooklyn…and beyond if you wish. Winter will see Edna Grant of Ingersoll Houses’ Garden of Eden gather her group at their community center. They’ll reflect on this year’s growing season and design the upcoming one. Herself an African-American, she’s the president of a very diverse garden club which includes Chinese and Indian residents born in Asia along with others like herself from North Carolina and points nearby. “We plant veggies and herbs in the back, flowers in the front along Myrtle Avenue. We have all colors of flowers: yellow, red, white, purple, blue. It’s simply beautiful. Every year we get better.” Elder hands nurture green glory in the same neighborhood where Richard Wright wrote Native Son. These efforts of affection in historic Fort Greene show a community that loves this craft. Ms. Grant says this development (NYCHA residents increasingly disown the word “projects”) has 39 distinct tended plots and a waiting list of 50 other residents who want their own. Many young adults stay active during this coldest time performing maintenance chores like Brooklyn farmers one hundred years ago. Green City Force is an AmeriCorps group formed entirely of young NYCHA residents, 18 to 24 years of age. Participants in this federal program repair worn wooden structures, remove debris and much more as they vest time toward scholarships. The force’s mission is to prepare young adults to succeed in their chosen careers by engaging them in public service, job training and academics related to the emerging clean energy economy. Every spring, Ms. Virginia Cunningham, who is a neighbor to Ms. Grant, plots against our climate zone. For mere dollars, she buys a young black tea tree and sees it through fall harvest. Her kitchen shelters the annual drying process this time of year as she prepares its leaves for cups of cold weather comfort until it’s time to plant again. Meanwhile, Anne-Marie Rameau, a Haitian immigrant retired from a career in medicine, uses her ever-expanding green patch in Canarsie to build community. 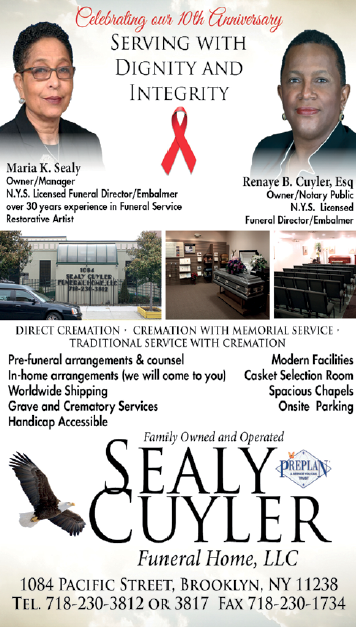 Her family’s work is the pride of Breukelen Houses. Her children help make this award-winning garden— a perennial presence outside her window – complete with a fish pond, vegetables and spectacular flower border meticulously composed from earliest spring to late fall. Truly a gardener’s garden, it’s been written about in the Canarsie Times. It’s even gained recognition at NYCHA’s annual garden competition which is juried by horticultural professionals. Just blocks away, Mr. Hester, a retired NYCHA employee, keeps the walkways around the management office of Glenwood Houses a reliably tidy mix of perennials and annuals. The summer rituals of Prince English are known to the world because his green thumb’s been journalized in the New York Times. With a style of planting to match his colorful personality, he’s helped make Walt Whitman Houses a known place to many near and far. Across town in Brownsville, Sadie Sanders, a current NYCHA employee, wants local children to know where their food comes from and how it looks whole. Her companion plantings of bulbs have gained Howard Houses recognition by the Daffodil Project. Never alone, all these gardeners are echoed in impact across a network of peers in all five boroughs. These men and women grow autobiographies in soil. Some southerners sow broccoli seeds, West Indians master peppers, late-blooming gardeners seek reliable crops while veterans raise collard greens and hops. Of note: The current administration of NYCHA has advanced large-scale expansion of this program owing much to the legacy they inherited. This article records but a glimpse of many who’ve called NYCHA home for several decades. Their superior-tasting heirloom vegetables, wisdom and enduring wealth of knowledge enrich our city – even for those who zoom by in buses and cars, catching mere seconds of beauty. 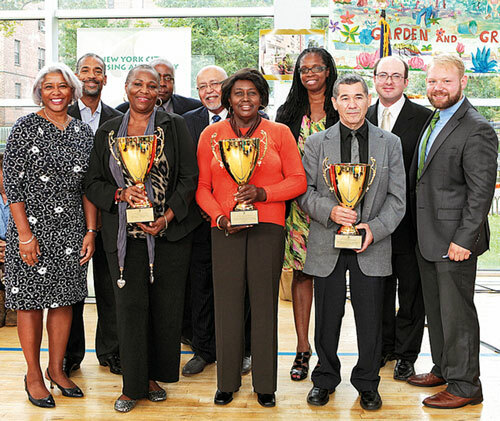 The Garden and Greening Program of NYCHA’s Department of Resident Engagement has deep roots. While New York replanted this concept from Chicago seeds in 1962, informal gardening had been active within public housing here since the 1930s. Public housing in New York was born amid epic social policy reforms of the New Deal. This was the heyday of Mary McLeod Bethune, Eleanor Roosevelt and Paul Robeson. Mayor Fiorello La Guardia, who founded the New York City Housing Authority in 1934, got massive federal subsidies to build clusters of buildings which now house 1 in 20 New Yorkers. Emblematic of early 20th century optimism, these brick towers replaced poorly built and kept housing with more sanitary conditions. Tragically, a dense web of social networks vital to civil society and everyday neighborliness did not survive the wrecking balls. On the bright side, however, working-class New York had barely known modern trash shoots, separate rooms to bathe and cook, ceramic passage walls to reduce the spread of disease, and reliable access to hot water. Originally a city program, the first development built with federal funds was the Harlem River Houses in Northern Manhattan sporting elegant ceramic sculpture by Richmond Barthe, a widely collected Harlem Renaissance artist. Morgan Powell is a horticulturist and landscape designer. He is also a blogger for Outdoor Afro.